Arkhangai (Mongolian: , literally Northern Khangai) is one of the 21 aimags of Mongolia. It is located slightly west of the countrys center, on the northern slopes of the Khangai Mountains. The Arkhangai aimag is located in the interior of the country and borders to the following other aimags: Bulgan (north east), Ovorkhangai (south east), Bayankhongor (south), Zavkhan (west), and Khovsgol (north west). The highest point is Kharlagtai Peak at 3,529 m (11,578 ft), while the lowest point is the area on the confluence of the Orkhon and Tamir rivers at 1,290 m (4,232 ft). The most well-known mountain is the extinct volkano Khorgo, which is part of the Khorgo-Terkhiin Tsagaan Nuur National Park. After the People’s Revolution won in 1921 throughout Mongolia reforms in administrative unit were made and the Tsetserleg Mandal Uul aimag was established on the foundation of Sain Noyon Khan aimag. Arkhangai aimag was formed from parts of the Tsetserleg Mandal Uul aimag in 1931. 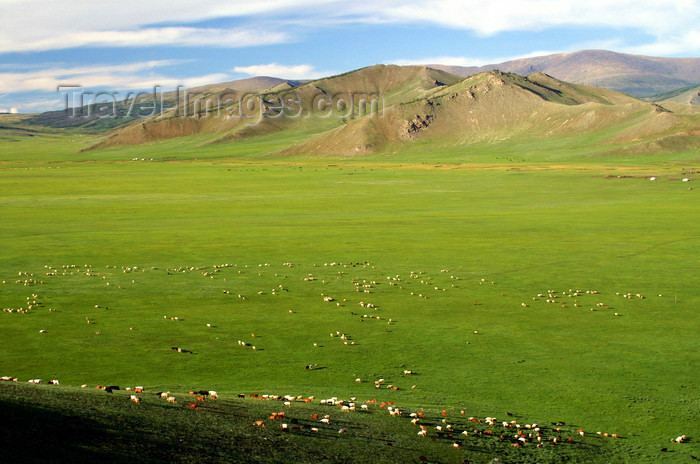 At that time, the aimag had 35 sums, 65,333 inhabitants in 22,285 households, and 1,800,000 head of livestock. The aimag center Tsetserleg was established at the site of the Zaya Khuree monastery, which had been first founded in 1586.